Men and child loss from a man's perspective. Dealing with the loss of a child. A man's perspective. My wife, Tania, was lying back with her tummy exposed at our appointment for the twelve week scan. A grainy image of our new baby appeared on the computer screen and as I made a point to mention that we’d like a photo to take home with us I noticed the lack of activity in the arms and legs and before the ultrasonographer said, ‘I don’t think this is good news’ I knew it was dead. When she moved the probe and shook it across Tania’s stomach our baby floated lifelessly to the bottom of the womb. That image (which my mind stubbornly clings to) signaled the beginning of some surprisingly intense grieving. I reached out and held Tania’s hand. She was asking questions about appointments, when exactly the baby might have died, the procedure that was needed to remove it. She was upset but she was handling it so well that I was almost angry at what was happening inside me. I was just about ready to fall apart but the thought of crying in front of other people had me fighting hard. I attempted to rationalize myself to a ‘stronger’ position; ‘It’s not even a real baby yet,’ I told myself, ‘Just a collection of cells.’ But my rational mind continued to be overwhelmed by that image. I saw my real baby there – the slope of his forehead, the promise of warmth in the chub of his cheeks, the limbs that should have been reaching and kicking. Even though it was not logical I felt that I had let him die alone. That I wasn’t there to help him as he died. And to let him down even more, to completely abandon him, I was just going to let them throw him away. Days of grief became weeks but to most people around me I was handling it well. Only Tania really saw moments of the raw emotion but even then I had a blanket over it. My main concern, right from the word go, had been to ensure that she was looked after – physically as well as emotionally. I set up a bed in the lounge room, dealt with condolences and most enquiries into her welfare, took care of all the household and child related chores. Keeping busy and focusing on Tania steadied me and took the focus away from my own grief. When things quieted down the emotions became overwhelming, their intensity disturbed and confused me, and I was left to battle myself again – it wasn’t even a real baby, I had never held it, I didn’t experience it physically like Tania. 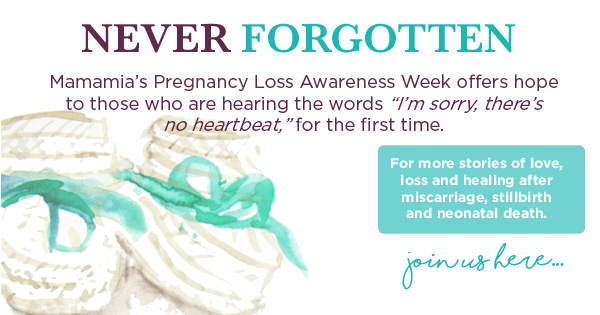 This week marks the start of Never Forgotten: Mamamia’s Pregnancy Loss Awareness Week. The questions and concerns were generally directed towards me but in nearly all cases were about Tania. And even though I appreciated the enquires into her welfare I began to feel as if I wasn’t entirely involved. It was as if this was only Tania’s experience. I’d already done enough to talk myself out of the grief I was feeling but every time someone skirted passed me to enquire about Tania an underlying belief was reaffirmed – as a man I wasn’t supposed to be feeling this way. Months later through a series of coincidences I met Sally and Simon Heppleston and learnt about their own story of loss. In 2008 they were prepared for their world to change when they attended a routine ante-natal appointment late in their pregnancy. They had created space in their lives – a new baby seat in the car, a new cot in the decorated nursery, a collection of infant jumpsuits and beanies. All of it awaiting animation through a new life. Their pregnancy had been without problems and when Sally went into early labor there was the joyous feeling that they were almost there. But Sally became concerned when the labor hadn’t progressed three days later, and she couldn’t feel any movement from her normally active baby. The world did change for Sally and Simon but not the way they expected it to. When the doctor performed the scan they could see there was no heartbeat. As Sally screamed out in disbelief Simon bottled an uprising of emotion to honor his overwhelming desire to lessen the impact on Sally. Pushing his own grief aside became a common theme, especially in the early days. He displaced emotion by focusing on the new list of tasks that needed to be completed; phone calls, discussions with doctors and nurses, referrals, appointments, questions from well meaning family and friends. But even when there was a moment to spare Simon, understandably, still channeled all his energy into the care of Sally, who was suffering physically as well as emotionally. The following day Sally was induced and delivered their stillborn baby, Hope Heppleston. The surreal experience for Mum and Dad was both horrific and beautiful. Hope appeared to be sleeping; a perfect baby in every way. Gavin Blue is the President of Heartfelt – a group of professional photographers who offer their services free of charge to provide beautiful and tasteful photographic memories for couples who have lost children. After he and his wife lost their own daughter, Alexandra Charlotte Blue, in 2006 Gavin noticed a gap in the healing process – many couples went home with no tangible proof of their loss. Heartfelt’s services offer a lasting acknowledgement of a baby or child’s life. They assist couples who have suffered stillbirths, or have premature and ill infants, children in the Neonatal Intensive Care Units of their local hospitals and children with serious and terminal illnesses. Maybe the key here is the disparity between men and women when it comes to having access to grief. When Tania talked openly about the details of her experience with some of her female friends I found I was fighting a rising feeling of resentment. But it is only after writing this article that I can see that resentment for what it truly is – jealousy. When Simon’s friends organized a day’s golfing shortly after his loss, he thought there would be some open discussion about what had happened to him. But some handshaking and backslapping ended a full day of ‘male bonding’ without the subject being raised at all. The closest I came to discussing my loss with male friends was to get an acknowledgement from a few mates that their wives had also had a miscarriage. My first thoughts on this were that ‘society’ makes it incredibly difficult for men to experience emotion. But now I think that’s only partly true. At the height of my grief I was in my backyard gym, locked away from view. When family and friends came to visit Simon he would straighten himself up, dry his eyes and hide the depth of his emotion. He told me he felt, ‘left out and forgotten about’ but admitted to feeling ‘weird’ when friends occasionally asked after him, ‘I’d give a stock standard answer and then redirect it back to Sally,’ he said. It’s true that people didn’t ask after us as often as they asked about our partners but maybe that’s because, as men, we have a way of ensuring that doesn’t happen. I’d imagine Simon’s buddies would have also felt a desire to bring up the subject that day on the golf course but then they would have had to deal with the very real possibility that Simon would have broken down. And now I’m remembering a phone call I received from a mate on the day the baby was ‘removed’ from Tania. I was offered something real from a man who had gone through the same experience but I fought back tears, avoided answering directly and ended the phone call with a forced steady voice. From a very early age boys and men are directed away from emotion. When we express it we often feel embarrassment and regret. Getting past this requires a giant leap over generations of training. Is there a way to take this leap? Maybe that’s what’s needed. The gentle focus of one brave man at a time. As more men are willing to mark out the first steps – to reveal their emotion, or to sit with the emotions of other men – we just might be able to take that collective giant leap. If this post has brought up any difficult or painful feelings or you need someone to talk to please call Kids and SIDS 24 hour bereavement support line on 1300 308 307. Heartfelt : giving the gift of photographic memories from Gavin Blue on Vimeo.